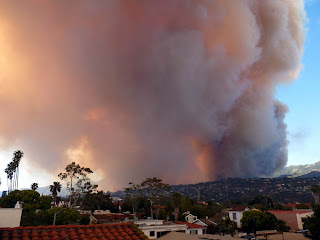 Santa Barbara is on fire and it's not looking very good for many homes. Thousands of people (last I heard was 30,000) have been evacuated. I was up in Santa Barbara on Wednesday doing some shopping. I didn't know that I was getting in the middle of a natural disaster! By the late afternoon, the downtown area was filled with a murky, twilight haze. Many of the shops had closed and they were asking people to clear the main streets so that emergency vehicles could get through. 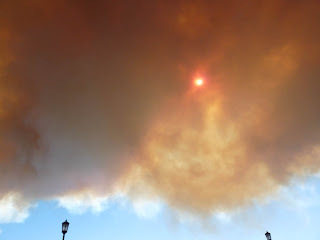 The smoke was so thick it obscured the sun. I figured that this was not a good time to browse the clearance rack at Macy's so the shopping day was officially over. 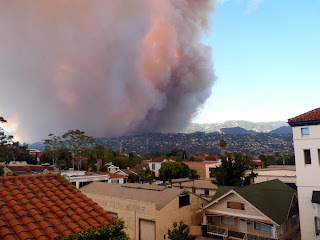 These photos were taken from the roof of a parking garage in downtown Santa Barbara. Of course, I am not one to miss a photo op. 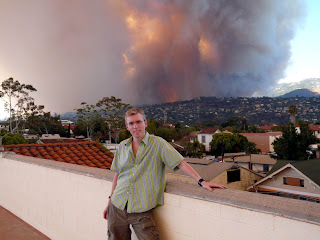 I do hope the fire is under control soon and my sympathies go out to all those people who have lost their homes.